Candidates’ biographical details and statements of their goals and objectives for the organization are below. I am honored to be considered as a candidate for treasurer of the World Federation of Neurology (WFN). I am familiar with the dedication of the executive and staff through my involvement in past World Congresses of Neurology (WCN) from 2005 to 2015. I have been a member of the Tournament Committee and have seen firsthand the culture of generous willingness to donate time and effort in the preparation of this aspect of the conference, as well as the teaching and scientific programs. I know from these past experiences that I can work well with current members of the executive. My nomination made me consider the role of WFN, and note its mission statement. This states “the mission of the WFN, as a UK registered charity, is to foster quality neurology and brain health worldwide, a goal we seek to achieve by promoting global neurological education and training, with the emphasis placed firmly on under-resourced parts of the world.” I strongly support these aims. The treasurer of an organization such as WFN carries a heavy burden of responsibility. There are numerous stakeholders, including all of the member societies, each of which will have their own view as to the priorities the WFN should pursue. The funds of WFN accrue as the result of efforts of all of its members, and all expect the funds to be used appropriately and efficiently. It is self-evident that the processes for dealing with the funds must be transparent and equitable. Every edition of World Neurology demonstrates the wide range of the WFN’s efforts to enhance neurological knowledge and improve neurological services to patients around the world. Initiatives of this type require funding so that inevitably the choice of projects undertaken must be approached prudently. Much of the WFN’s income derives from its scientific meetings, and the financial successes of these depend in large part on the extent of support from pharmaceutical and related industries. The enthusiasm of pharmaceutical companies depends, in turn, on the nature of their products and the stage of commercial development of each product. These factors are, of course, outside the control of the WFN. The management of the WFN’s finances, therefore, require an astute and flexible approach aimed at maximizing income, using income as available to fund projects around the world and efficient administration. Prudence requires that projected income streams be realistic and take into account uncertainties related to pharmaceutical industry support. As treasurer of the Sydney 2005 World Congress of Neurology (which was a huge financial success and has contributed to WFN’s capacity to fund ongoing projects) and of the Australian Association of Neurologists (1997-2003) during a period of its growth, I am well aware of the challenges facing an organization such as the WFN and of the need for careful and prudent management of its finances. These positions naturally involved efforts to maximize income from industry, as well as other sources, so I am familiar with what is required to achieve success in these areas. The experience of being treasurer of WCN 2005 also highlighted the need to be acutely aware of the potential effects of fluctuations in exchange rates and other consequences of the globalization of economies. WCN 2005 took place at a time of substantial exchange rate volatility, and the measures that had been put in place to minimize adverse impacts of this volatility contributed to the financial success of the conference. The WFN has a strong tradition of efficient use of funds. This, of course, contrasts with the situation in some other high profile international organizations and relies on the generous donation of time from the executive, as well as the hard work of administrative staff. This efficiency must continue. If elected, I undertake to work diligently with the executive to ensure that the financial management of the WFN allows it to pursue its aims and objectives as effectively as possible. I am a professor emeritus of neurology and former head of the department of neurology, University of Basel, Switzerland. I have been a member of the Executive Committee of the European Neurological Society (ENS) since the foundation of the society and was also president of the ENS. I was in charge of its finances and served as treasurer. I chaired the Evaluation Committee of the ENS fellowship program and was a member of the Examination Committee of the European Board of Neurology. My research interests have centered on neuroimmunological aspects of neurological diseases, such as multiple sclerosis, inflammatory neuropathies and paraneoplastic syndromes. I am currently the president of the Scientific Council of the International Foundation for Research in Paraplegia in Geneva and chair the Neuromuscular Research Association Basel. I am a member of several international societies, such as the Neuromuscular Research Group of the WFN and a faculty member of F-1000. I am a past editor of the Swiss Archives of Neurology and Psychiatry, a former president of the Swiss Neurological Society and a regular reviewer of scientific journals. I am a fellow of the American Neurological Association and a fellow of the European Academy of Neurology. Large international organizations, such as the WFN, need a strong management structure to sustain the challenging demands in a rapid moving world. This has led to the decision to separate the post of secretary-treasurer general into two, one of secretary general and the other of treasurer. In high insight, this is a natural evolution toward more transparency, and most scientific societies today follow this model. The newly created function of treasurer is an important position of trust and responsibility situated between the president, secretary general, trustees and member societies. Over the years, the WFN has experienced increased operating expenses, in particular through its worldwide initiatives, grants and spending on member activities, which help to realize its main goals as a global scientific society. In this respect, an important role of the treasurer is to keep the WFN on a sound and sustainable financial basis, while allowing the WFN to meet its growing support needs by encouraging new projects and co-sponsorships with other institutions or scientific societies. While the WFN is by essence a global player, there are an increasing number of large international neurological societies taking regional and supranational coordinating roles. An example of this is the newly created European Neurological Society (EAN). The two existing European neurological societies, the European Neurological Society (ENS) and the European Federation of Neurological Societies (EFNS), have now joined forces to build the EAN. The newly established organization has inherited funds of the two previous ones. This puts it in an excellent position to take on new challenges, such as a recently initiated partnership program across the Mediterranean to involve associate member countries. The newly formed Pan American Federation of Neurological Societies (PAFNS) is representing neurology in Latin America a region in full development, where the 22nd World Congress of Neurology (WCN) is taking place in Santiago, Chile. The 23rd WCN will be organized by the Asian Oceanian Association of Neurologists and take place in Kyoto, Japan. The WFN should take advantage of the unique opportunity to collaborate with these international societies to advance our field. The challenge for the WFN in the coming years will be to coordinate its global involvement by interacting not only with national, but also new international scientific organizations. In order to maintain a sustainable growth, the cooperation’s projects should be well planned to avoid overlapping programs. A better integration and coordination of the WFN applied research groups would help foster quality neurology worldwide. Efforts should be made to streamline the budgeting process and assure that management accounting allows for an ongoing monitoring of income and expenditures. The sources of finances for the WFN include membership dues and income from congresses and publications. Moving the World Congress of Neurology from a four-year to a two-year cycle has brought in more money. Going to a one-year cycle of meetings would allow not only for continuity in organization and strengthening of corporate identity, but also would further increase income, a welcome move in a time of shrinking resources. Engaging with partners to share costs should bring additional sources of revenue. As a long-standing member of the Executive Committee of the ENS, where I was in charge of the finances, I bring the needed managerial experience. I am convinced that I can fulfill this important function of treasurer to the satisfaction of the WFN and its members. I have had the privilege to serve as Canadian delegate to the World Fedeartion of Neurology (WFN) since 2007, as a member of the WFN Education Committee since 2010 and as co-chair of the eLearning Task Force of the Education Committee, alongside Prof. Riadh Gouider from Tunisia. I am also honored that the Canadian Neurological Society has nominated me for the important position of WFN trustee. By way of background, I am chair of the International Development Committee of the Canadian Neurological Sciences Federation, and I have served as president of the Canadian Neurological Society, Canadian Congress of Neurological Sciences (now Canadian Neurological Sciences Federation) and Federation of National Specialty Societies of Canada. At the hospital level, I am head of neurology, executive medical director of the Centre for Memory and Neurotherapeutics, and director of the Sam and Ida Ross Memory Clinic at Baycrest Health Sciences. At the university level, I am a professor in the Division of Neurology, department of medicine, and director of the Behavioral Neurology Section, Division of Neurology, University of Toronto. My clinical focus is behavioural neurology. I am also a scientist at the Rotman Research Institute of Baycrest Centre. My research is aimed at both improving our understanding of the mechanisms underlying cognitive impairment due to frontotemporal dementia and Alzheimer’s disease and development of cognitive test procedures. For example, my colleagues and I have contributed to the use of clock drawing as a bedside cognitive assessment tool. I have taken an active international leadership role in education. Since 2005, I have focused on eLearning using videoconferencing as an electronic medium to bring together health care professionals from across the globe within a virtual classroom. This has been done within the context of international videoconference rounds in behavioral neurology. The goal is to develop greater international communication and links in behavioral neurology, and to transfer knowledge at the basic science and clinical levels internationally through joint educational programs. American, Canadian, Cuban, Israeli, Jordanian, Russian, Saudi Arabian, South African, Spanish and Swiss (World Health Organization) hospitals have participated. The audiences are multidisciplinary and include neurologists, psychiatrists, geriatricians, family physicians, nurses, social workers, occupational therapists and psychologists, as well as trainees in these disciplines. I was awarded the prestigious Colin Wolf Award from the Faculty of Medicine, University of Toronto, for this initiative. An important development that was modeled on the international behavioral neurology videoconference rounds was the formation of an international neurology resident initiative in 2008, i.e., the Neurology International Residents Videoconference and Exchange (NIRVE), which promotes international collaboration among neurology residents. Participating sites have included Brazil, Canada, Chile, Ethiopia, France, Jordan, Nigeria and Russia. In addition to the rounds, NIRVE has led to resident exchange visits between Russia and Canada. More recently, I have collaborated with Prof. Riadh Gouider to create a new series of international videoconference rounds in behavioral neurology involving Africa and Canada, which was supported by a WFN grant awarded during Dr. Vladimir Hachinski’s term as WFN president. My goal as WFN trustee is highly focused and directly related to the mission of the WFN. This is to promote “global neurological education and training with the emphasis placed firmly on under-resourced parts of the world.” I hope to achieve this goal through innovative eLearning programs, which will include a significant expansion of our network of international sites for video conference rounds that target neurologists, allied health care professionals and trainees in neurology and related disciplines. The focus will be expanded from our highly successful behavioral neurology series to include a broad spectrum of areas within neurology with the opportunity of adaptation of new technologies. The ongoing programming series will involve both developing and developed countries so that knowledge can be transferred from one to the other in both directions. I recognize the financial challenges facing under-resourced parts of the world, and the barriers that this poses for successful knowledge transfer through eLearning. However, in keeping with the mission of the WFN to promote global neurological education and training in these regions, I will apply all the resources at my disposal to help fulfill this mission with full emphasis on under-resourced regions. I have a vision, a clear sense of direction and the focus to facilitate knowledge transfer for enhancing brain health across the world, especially where it is needed the most. Those who know me say that I am an excellent team player and organizer, qualities that are essential for success of the outlined goals. This success will require extensive collaboration and coordination involving many people with diverse needs, across many countries, to promote the WFN’s mission in global neurological education and training. It would be an honor and a great privilege to be elected by the delegates as a trustee of the World Federation of Neurology (WFN). In support of my candidacy, I will begin this statement by providing some biographical information about my qualifications and experiences, which have led to my current involvement with this critically important organization. I am currently professor of neurological sciences at Rush University Medical Center in Chicago, where I also serve as associate chairman, head of the Section of General Neurology and director of the neurology residency training program. My undergraduate education was at Yale University, where I received my degree in molecular biophysics and biochemistry. I received my medical education at Stanford University School of Medicine, and I performed my medical internship and neurology residency at the University of Chicago. My national activities in neurology include my current chairmanship of the Neurology Residency Review Committee of the Accreditation Council for Graduate Medical Education, the committee that oversees training requirements and makes accreditation decisions regarding all neurology residency training programs in the U.S. I also recently chaired the Neurology Milestones Committee that developed the training milestones for all U.S. neurology residency trainees. I have been highly involved with the American Academy of Neurology (AAN) for many years, including being current chair of the AAN Examination Subcommittee and section co-editor for continuing medical education (CME) for Neurology. I was vice-chair of the AAN Education Committee, and I chaired the AB Baker Section of Neurologic Educators. Three years ago, I had the privilege of being appointed by the AAN as editor-in-chief of Continuum: Lifelong Learning in Neurology, the AAN’s official CME journal. Fortuitously for me, my work as editor-in-chief of Continuum also has led to my entry into significant involvement with the WFN and its support of global neurologic education. A joint program of the AAN and the WFN provides Continuum to 45 neurological societies whose Continuum user groups include thousands of participants worldwide who would otherwise be unable to access this important educational resource. 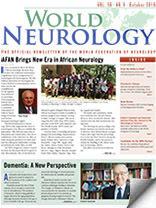 This program, supported by a generous donation from the AAN and its publisher, Wolters Kluwer of 400 print copies of each issue as well as free online access for every participant, has been extremely highly received, and Continuum has served as a critically important educational tool for neurologists in training and in practice worldwide. Two years ago, I had the privilege of being appointed as chair of the WFN Education Committee, allowing me to expand my involvement further beyond Continuum into the many other global educational efforts of the WFN, including growth of the WFN teaching centers, the awarding of WFN traveling fellowships and other endeavors. Most recently, Dr. Wolfgang Grisold (WFN secretary treasurer-general) and I have begun the first steps in development of a global educational curriculum for neurological training, to be developed with the assistance and input of the members of the WFN Education Committee. We feel that the WFN is in a unique position to develop such a curriculum to enhance neurological training worldwide. One year ago, I was asked to serve as a WFN co-opted trustee, a position that has given me the opportunity to be even more highly involved in this important organization. I especially feel privileged to have been able to work closely with and learn from such esteemed mentors as Dr. Raad Shakir, president; Dr. William Carroll, first vice-president; Dr. Wolfgang Grisold, secretary treasurer-general; and Dr. Riadh Gouider and Dr. Amadou Gallo Diop. Their knowledge and experience in global neurology, and their combined histories with and institutional knowledge of the WFN, have been invaluable in my personal development to become an effective member of this organization. In my roles and experiences with the WFN thus far, coupled with my communication with neurologists globally as Continuum editor-in-chief, I have been impressed by the remarkable similarities of the needs of neurologists worldwide, while also being keenly aware of the important differences in available resources and in access to care. The WFN should continue to play in integral role in enhancing access to quality neurologic education and training and to foster neurological health, including via continued partnerships with national neurologic organizations to access publications and educational programs (such as the partnership with the AAN for Continuum); continued involvement with the World Health Organization; an increased number of partnerships to provide regional teaching centers for neurologic training (such as is now in place in Rabat and Cairo, and currently being developed in Cape Town and Dakar) and department visits for brief subspecialty training experiences (as currently in place in Turkey, Austria and Norway); increased recognition of the availability of travel stipends and research grants to provide as many individuals as possible with access to these important (and sometimes life-changing) opportunities; and continued development of global initiatives, such as the development of a global educational curriculum. The WFN also can continue to increase its visibility to individual members of all neurologic societies, which will further our constituents’ access to our initiatives. My background and experience as a neurological educator, editor and general clinical neurologist, I feel, provides a unique set of qualifications to help continue and even further enhance the role of the WFN and its 117 professional neurological society members to promote neurologic education and training with the goal to improve global neurological health. I would be honored and privileged to become an elected trustee of the WFN and to serve its members faithfully. The national neurology societies of Bulgaria, China, Germany, Hungary, Kazakhstan, Kuwait, Mexico, Pakistan, Rumania, Saudi Arabian, Slovenia, the United States and Vietnam have honored me by nominating me for the trustee position. I was born in North Vietnam and moved with my family to South Vietnam in 1955 as a result of the war. I was one of the first Vietnamese to come to Germany in 1967 to study medicine at the University of Freiburg. I specialized in neurology and psychiatry. Marriage brought me to the U.S. in 1982, where I continued my training in neurology, first with a residency at the Medical University of South Carolina and later with a fellowship at Columbia University and London’s National Hospital for Nervous Disease. My journey with the World Federation of Neurology (WFN) began in 2002, when I was given the honor to serve as a member of the Publication Committee. I was entrusted with the task of improving upon World Neurology. At the time, the newsletter was printed in India and mailed to subscribers worldwide. It arrived six months later by regular mail due to the cost of airmail. To reduce costs and expedite circulation, I proposed the transition to an Internet-based newsletter with regional interests. This proposal was later implemented as the current World Neurology. My association with the WFN gave me the opportunity and cover to safely develop educational programs for Vietnam, as Vietnam had just begun opening its doors to the West. I implemented the format of the International Neurology Forum, consisting of a short course focused on one topic lasting one to two days. This format was the product of repeated observations that physicians from developing countries did not demonstrate high retention of new techniques learned from broad, lengthy meetings. However, when trained collectively in a large group in their own countries, there was a much higher chance that their practice patterns would change. I organized this format in subsequent forums in developing countries, such as Mongolia, Indonesia, Uzbekistan and Kazakhstan. Over the years, I also have served on the Fundraising Committee, Membership Committee, Education Committee and Editorial Boards of World Neurology and the Journal of Neurological Sciences. I firmly believe that the furthering of scientific medicine requires a global effort. I have joined with my other three colleagues to edit a textbook, International Neurology, with the contributions from more than 200 neurologists from 80 countries around the world. Member, Research Committee on Parkinson’s Disease, WFN, (2004- 2010). The editorial staff of the Journal of the Neurological Sciences (JNS) and Elsevier have been working closely with the organizers of the upcoming XXII World Congress of Neurology (WCN) to provide easy access to the 1,461 abstracts being presented there. All of the abstracts will be published in JNS and will be available online as open access just before the congress begins. Additionally, there will be a congress app, which will include a link to the journal to ensure that attendees can view all the abstracts. The congress venue will have WiFi in the public areas. Attendees without smartphones or mobile devices will be able to access the abstracts at Internet and abstract viewing stations. I believe that these processes will enhance everyone’s educational and social experiences at the congress. I look forward to meeting with many of you at the WCN 2015 in Santiago, Chile. Wildea Lice de Carvalho Jennings Pereira, et al., provides a comprehensive review of neuromyelitis optica (NMO). Ever since the discovery of the specific antibody against aquaporin-4 (anti-AQP4), which is associated with NMO, there has been great interest in this disease. Most of the major neurology and neuroscience journals, including JNS, publish several original articles each year describing new aspects of NMO. This article is very useful and timely, since it summarizes the current knowledge of the epidemiological, clinical and immunological aspects of the disease. It also describes the currently recommended treatment strategies for NMO. W.L. de Carvalho J. Pereira, E.M.V. Reiche, A.P. Kallaur, D.R. Kaimen-Maciel, “Epidemiological, Clinical and Immunological Characteristics of Neuromyelitis Optica: A Review,” J. Neurol. Sci. 355 (2015): 7-17. Joerg-Patrick Stubgen provides a summary of the types of peripheral neuropathies that are associated with lymphoma. Clinically-evident “dysimmune” neuropathies occur in approximately 5 percent of patients with lymphoma; however, electrophysiologically-evident neuropathies have been reported in as many as 35 percent of patients with various types of lymphoma. And, these prevalence assessments do not include the frequent treatment associated (largely chemotherapy-induced) peripheral neuropathies. The spectrum of peripheral neuropathies associated with lymphomas is wide, and the etiology is complex and poorly understood. As emphasized in the article, accurate clinical diagnosis of the type of neuropathy and proper categorization of lymphoma are both important to ensure selection of the most appropriate and effective treatment strategies. J-P.Stubgen, “Lymphoma-associated Dysimmune Polyneuropathies,” J. Neurol. Sci. 355 (2015): 25-36. Considering that book printing was invented in the early 15th century (Johannes Gutenberg, Mainz, Germany) and the copying of texts before that period had to be done by hand, one wonders whether writer’s cramp has been described in the middle ages. 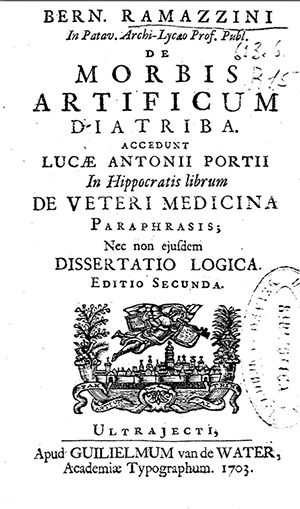 As far as I now, it has not been referred to before the description by the Italian physician Bernardino Ramazzini (1633-1714) who, in 1713, published a book on occupational diseases and since then has been considered the father of occupational medicine. His book De Morbis Artificum Diatriba (Diseases of Workers) indeed contains a large number of occupations with associated disorders. In the chapter “Diseases of Secretaries, Clerks, Writers and Copyists,” Ramazzini started to refer to the ancients, who had more copyists and writers than in his days, and to the Roman writer and naturalist Pliny, who, on his journeys, was usually accompanied by a writer with a book and tablets. In Ramazzini’s own environment, secretaries and clerks of princes, magistrates and merchants were paid to keep the books, and registers and were “subject to several diseases that depend either to the sitting position that they are obliged to conserve for long periods, or from the continuous movement of the same hand, or finally from the mental effort necessary not to make errors in their calculations.”1 He continued to describe the necessity to hold the quill continuously and move it for writing, and that it fatigues the hand and even the whole arm, due to the continuous contraction of the muscles. Ramazzini was acquainted with a writer, who had been writing his entire life, by which he had gathered some fortune. He experienced at first a considerable lassitude in his whole arm that resisted against all kinds of remedies, and that ended in a complete paralysis of that arm. He taught himself to write with his left hand, but, after some time, the arm became afflicted with the same disease. Ramazzini added that the mental efforts, to which clerks are subject, may result in migraines, colds and swelling of the eyes. To prevent these diseases, the author advised to do exercises in the evening and during holy days. 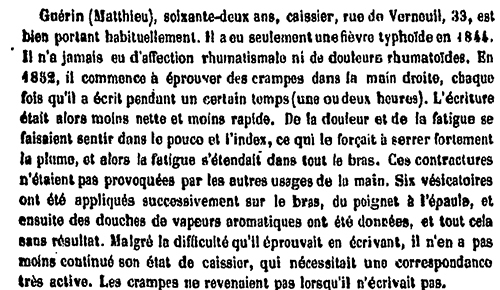 Interestingly, he also wrote that “the use of tobacco may diminish their headaches,”1 and for the paralysis of the hands, they should wash them with aromatic wine or liquors. 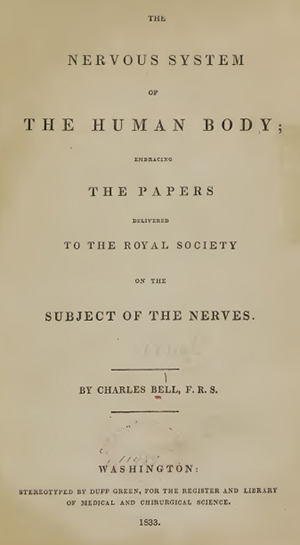 The well-know Scottish surgeon Charles Bell — of Bell’s palsy — may have presented an early observation in the 1833 edition of his Nervous System of the Human Body,2 where, under the title “Partial Paralysis of the Muscles of the Extremities,” he wrote that it is an obscure object … an affection of the muscles which are naturally combined in action.” Bell found the action necessary for writing gone, or the motions so irregular, as to make the letters be written in zigzag, while the power of strongly moving the arm, or fencing, remained. The extraordinary disease could not be localized in the muscles, but was believed to arise from a general nerve irritation that is only present in muscles fatigued after much writing. The thumb and secondly the index finger are most often involved, with the text noting the illness is described easily as shaking, or as stiffness, mostly as a hasty flexion movement. 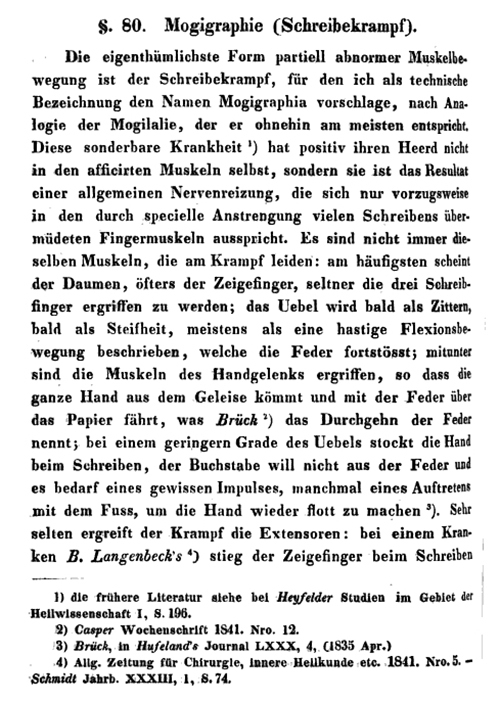 He also referred to Moritz Reuter, who told about a 30-year-old famous composer “to whom, since 10 years, every time when playing the piano, the right middle finger fails by upcoming spasm,” possibly referring to Robert Schumann.3 The origin of writer’s cramp was thought to be in the spinal cord (hence the book’s name, spinal neurosis), and a section of a tendon was sometimes suggested. 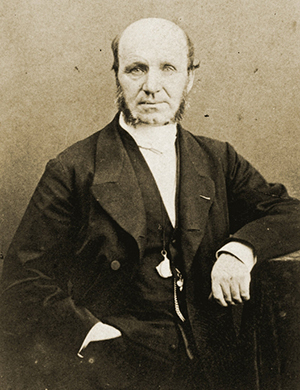 Guillaume B.A. 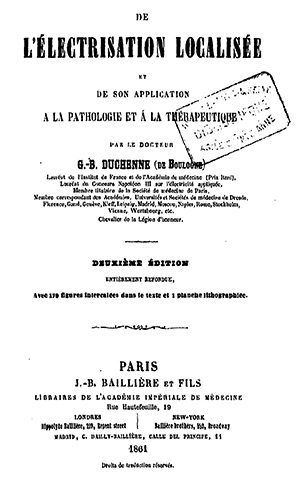 Duchenne de Boulogne, the well-known French physician, who used to visit Paris hospitals to apply electric therapy for all kinds of diseases, described several cases of writer’s cramp in his De l’électrisation Localisée.4 Case 213, Matthieu Guérin, age 62, was a cashier, who, in 1852, started to complain of cramps in his right hand each time when he wrote for a certain period of time. 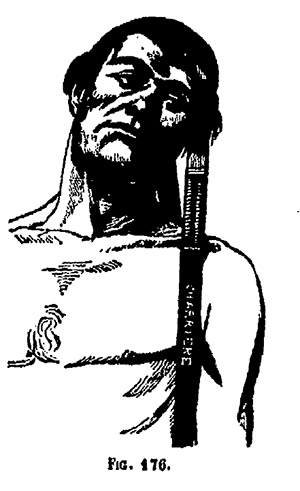 He suffered from pain and fatigue in his thumb and index finger, which forced him to hold the quill tightly. The fatigue would spread through his entire arm. He did not experience any symptoms when using his hand for other tasks. He was treated by six vesicatories and by douches with aromatic vapors without any relief. Two years later he was not able to hold the quill anymore, and he had taught himself to write with his left hand. 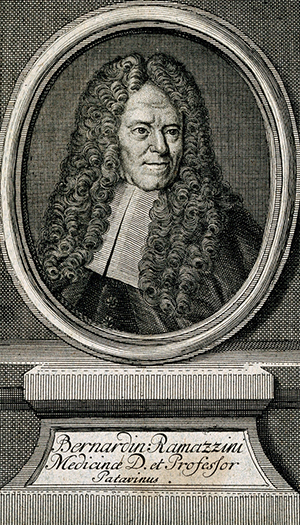 Introducing other cases of crampe des écrivains, he wrote that the affliction was known in Germany with the name schreibekrampf. He had noticed that the muscles involved could vary. In a stockbroker, he observed flexion of the index finger as soon as he had written a few words. In an office worker at the war ministry, the first two fingers took an opposing position upon writing. Duchenne also saw supination of the hand. The treatment of what he called spasme fonctionnel was usually disappointing. He applied local faradisation during 12 years in 30 or 35 cases, but only saw two successful cases. Obviously, writer’s cramp has been a disorder that existed for centuries, has been described in many countries and most probably already existed prior to Ramazzini’s description. Perhaps other than (medical) sources should be consulted to find them. Bell C. Nervous system of the human body. Washington, Green, 1833, p. 221, case no. 86. Hirsch G. Beiträge zur Erkenntnis und Heilung der Spinal-Neurosen. Königsberg, Bornträger, 1843, p. 430. I was awarded a World Federation of Neurology travel grant, which enabled me to attend the important and interesting First Congress of the European Academy of Neurology, June 20-23, 2015, in Berlin, Germany. I am grateful for the support of World Federation of Neurology. The well-organized congress offered an interesting scientific program, which included symposia, classroom teaching courses, hands-on courses, special sessions, satellite symposia, focused workshops, interactive sessions and practical courses. As a new congress feature, all posters were presented only as e-posters. Within the poster area, 12 large screens, 18 mid-size screens and 25 computer stations were available so presenters and participants were able to interact with each other. There were two types of poster sessions: posters with discussions and flash posters. During the posters with discussions, a chairperson presented and discussed each presentation with the presenter and audience. Each presenter had three minutes of presentation time and approximately two minutes of discussion. My poster presentation with discussion was “Cognitive Outcomes of Children with Fetal Antiepileptic Drug Exposure at the Age of 3-6 years — Preliminary Data” during the Child and Developmental Neurology session [©2015 European Journal of Neurology, 22 (Suppl. 1),120-483.] I enjoyed the great opportunity to receive remarks from my colleagues from Europe about our study. Nino Gogatishvili, MD, is a pediatric neurologist and a PhD student at the Institute of Neurology and Neuropsychology, Tbilisi, Georgia. Neuroimaging is an important adjunct to clinical neurology. We cannot easily examine the brain directly. The neurologic exam is designed to allow us to make reasonable inferences about abnormalities of neurologic functioning, and neuroimaging helps us visualize the brain. This significantly enhances our ability as clinicians to diagnose the cause of a neurological abnormality and monitor response to an intervention. This is particularly true in neurodegenerative diseases, where the neurologic exam has been immensely assisted by neuroimaging. Indeed, with advances in neuroscientific knowledge, novel imaging techniques have been developed to provide additional insights into neurological functioning in health and disease. 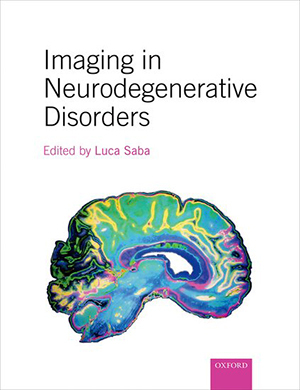 Prof. Luca Saba has edited a comprehensive textbook Imaging in Neurodegenerative Disorders (Oxford University Press, 2015, 562 pages including an index). As the title indicates, this volume focuses on neurodegenerative diseases. While neurodegeneration has been an elusive domain of neurology, recent advances in imaging have contributed importantly to advancing clinical and scientific knowledge in this area. The book consists of 10 sections. The introduction focuses on specific background knowledge areas, such as epidemiology, health economic considerations and molecular biology. A lengthy chapter is devoted to symptoms associated with neurodegenerative diseases, and readers might have found it easier to have portions of this chapter included in sections devoted to imaging of patients with the corresponding conditions. Imaging techniques are presented in section two, which chapters devoted to computed tomography, magnetic resonance imaging, nuclear medicine and positron emission tomography. Although recent advances in techniques related to positron emission tomography are discussed, it is unfortunate that there is not an equivalent chapter on advances related to magnetic resonance imaging. The heart of the text is in the subsequent seven sections. Each is devoted to a specific domain within neurodegeneration. Two large sections are devoted to disorders of cognition and movement disorders. The Cognition Section includes chapters on Alzheimer’s disease and an authoritative chapter on frontotemporal dementia by Jennifer Whitwell. The Movement Section includes chapters considering Parkinson’s and Huntington’s diseases. This area of neurology is undergoing an important revolution. As treatments emerge for the underlying histopathologic abnormalities, classification based on phenotype gradually is giving way to classification based on targets of treatment, namely, pathology. Phenotype-based classification has resulted in the inclusion of the chapters considering dementia with Lewy bodies and corticobasal syndrome in the Cognition Section, while conditions caused by similar histopathologic abnormalities, such as progressive supranuclear palsy (a tauopathy) and multisystem atrophy (a synucleinopathy), are placed in the Movement Section. The section on strength contains a single authoritative chapter by Martin Turner, who considers imaging in amyotrophic lateral sclerosis. A considerable portion of this chapter is devoted to extramotor brain involvement. This appropriately acknowledges that up to half of patients with amyotrophic lateral sclerosis have cognitive deficits, and suggests that the title of the section might be adjusted. Additional sections include chapters discussing coordination, demyelinating disorders, trauma and the peripheral nervous system. The final section is devoted to neuroimaging after therapy. This is a crucial consideration as therapies emerge for neurodegenerative diseases. It might have been useful here to consider quantitative measurement in neuroimaging since many of these techniques are being used as endpoints in treatment trials. Imaging in Neurodegenerative Disorders is a comprehensive text that has an appropriately broad scope. Chapters are devoted to all the key areas in neurodegeneration, and the chapters are comprehensive. The book is generally well illustrated, although occasional images seem to have lower resolution than is needed to illustrate a finding optimally. I recommend this text to students of neurodegeneration who are interested in a comprehensive introduction to neuroimaging. 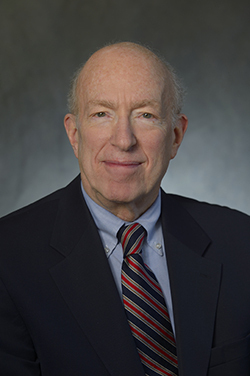 Murray Grossman is a professor of neurology, Penn Frontotemporal Degeneration Center, at the University of Pennsylvania, Philadelphia. Presently, low- and middle-income countries account for more than 85 percent of the global stroke mortality.4 Stroke mortality rates are especially high in Africa and Asia, where the burden of preventing and treating communicable diseases may shift resources away from cardiovascular disease and stroke.5 However, the burden from chronic and non-communicable diseases is likely to exceed the burden from communicable diseases in low- and middle-income countries in the near future. A global focus on reducing mortality and morbidity from cardiovascular disease and stroke is more urgent than ever. Major problems shared by many countries are a lack of infrastructure, inadequate systems of care, effective programs to address cardiovascular risk factors, financial difficulty and shortage of trained health care workers.3,6 Advocacy efforts, partnerships between countries, efficient and cost-effective targeted interventions and allocated funding and resources are necessary to tackle the worldwide stroke burden. Stroke began to be tracked globally via surveillance systems in 1968 with the World Health Assembly, after which data including incidence, mortality and case-fatality was tracked. In more recent years, a more sophisticated stepwise approach to stroke surveillance has been recommended by the World Health Organization to include not only individuals with non-fatal events in the community, but also those admitted to the hospital. Health systems of care for stroke require financing, staffing and structure in order to produce results. For example, the administration of intravenous alteplase (IV tPA) has been seen to significantly improve outcomes after acute ischemic stroke. However, giving IV tPA appropriately to eligible patients requires infrastructure and organization. Several countries have successfully developed systems to administer IV tPA (e.g., Brazil, Argentina, China and India), but there are still many barriers in low-income countries where medical services may be scarce and not easily accessible due to geography or human resources, and IV tPA may be prohibitively expensive. Although stroke burden is significant regardless of cardiovascular risk factor burden, the overall risk factor burden is increasing in low- and middle-income countries.6 For instance, hypertension is held accountable for approximately 54 percent of global stroke burden; this could be especially important as a target for intervention in countries such as China, where rates of hypertension are increasing.1 As many of the population in low- and middle-income countries with stroke are working age (41-65) adults, more smoking has been seen in working-age adults than in other age groups. It also may be beneficial to incorporate new and innovative, yet still cost-effective, techniques to address the global burden of stroke. Some innovative approaches to address primary stroke prevention, namely by using smartphone technologies, have been suggested and are being tested. Researchers from New Zealand have developed the Stroke Riskometer app, which assesses responses to a short questionnaire and determines the five- and 10-year risk for stroke using a validated algorithm similar to the Framingham risk score.8 It also incorporates education, comparison with similar individuals and an opportunity to share risk assessment results with others. An update of this app allows for participation in an international epidemiological research study (the Reducing the International Burden of Stroke Using Mobile Technology, or RIBURST study), which involves more than 160 countries. Besides the interventions on a patient and community level, countries with high rates of stroke mortality must set priorities that are attainable and commensurate to resources. Better definition of stroke traits and determinants in low- and middle-income countries are needed to develop culturally-specific stroke prevention strategies. International agencies must work together to develop more novel strategies to attack the stroke epidemic. The UN General Assembly already has attempted to do this by setting a goal of reducing mortality from non-communicable diseases by 25 percent by the year 2025.3 Collaboration, vision and innovation are needed to reduce the global stroke burden and the stroke disparities that exist between countries. Mukherjee D, Patil CG, “Epidemiology and the Global Burden of Stroke,” World Neurosurg, 76 (2011): S85-90. Deresse B, Shaweno D, Epidemiology and In-hospital Outcome of Stroke in South Ethiopia, J Neurol Sci, 355 (2015):138-42. Berkowitz AL, Stroke and the Noncommunicable Diseases: A Global Burden in Need of Global Advocacy, Neurology, 84 (2015):2183-4. O’Donnell MJ, Xavier D, Liu L, et al, Risk Factors for Ischemic and Intracerebral Hemorrhagic Stroke in 22 Countries (the INTERSTROKE Study): A Case-control Study, Lancet, 376 (2010):112-23. Kim AS, Johnston SC, Global Variation in the Relative Burden of Stroke and Ischemic Heart Disease, Circulation, 124 (2011):314-23. Fuster V, Voute J, Hunn M, et al., Low Priority of Cardiovascular and Chronic Diseases on the Global Health Agenda: A Cause for Concern, Circulation, 116 (2007)1966-70. Johnston SC, Mendis S, Mathers CD, Global Variation in Stroke Burden and Mortality: Estimates From Monitoring, Surveillance and Modeling, Lancet Neurol, 8 (2009):345-54. Feigin VL, Krishnamurthi R, Bhattacharjee R, et al., New Strategy to Reduce the Global Burden of Stroke, Stroke, 46 (2015):1740-7. Sarah Song, MD, MPH, is an assistant professor in the Section of Cerebrovascular Disease, department of neurological sciences, Rush University Medical Center, Chicago, Illinois. The World Federation of Neurology will have its showpiece biennial World Congress of Neurology (WCN), with Santiago, Chile, hosting Oct. 31-Nov. 5. This is the only international congress where all neurology specialties and interest groups have their chance to interact and show their progress to an international audience. The Scientific Program Committee tries to contact all interested groups to ask them to convene sessions with their proposed topics and speakers. The choices for the number of sessions and topics are most difficult to get absolutely spot-on, and there always will be some topics or groups needing more time or attention. The Organizing Committee tries hard to have wide and varied representations. This has to be balanced against the paramount goal of bringing the most up to date science to the audience. Participation of regional neurological associations, which have their own congresses, adds a different slant to the WCN. The six regions of the world are represented, and their sessions are left to them to organize. This is always interesting and adds and element of specific regional flavor to observe and share with the entire world. Participation of sister brain alliance organizations represented by their symposia puts another dimension to the WCN. It is most important to see that psychiatry, neurosurgery, rehabilitation, child neurology and brain scientists participate with their own symposia. This only emphasizes brain health as a single entity. Presidents of all these organizations attend and deliver their views on common topics. It is most important for neurologists to closely interact with allied specialists in combating all aspects of diseases of the nervous system. Neurologists, psychiatrists and neurosurgeons are moving closer in understanding brain physiology, and as an example deal with issues such as deep brain stimulation in various conditions, such as movement disorders, epilepsy, depression, anxiety and obsessive compulsive disorder. On the other hand, the field of the dementia further cements the close relationship between neuroscientists, neurologists and psychiatrists. The use of fMRI has an increasing role in all specialties and our understanding of basic brain dysfunction has been revolutionized. The WCN program brings all this to the fore, and the days of living in silos are long gone. The World Health Organization (WHO) and interest in non-communicable diseases is the way to move ahead in promoting neurological education and care. The WCN offers a symposium jointly with the WHO, as it has done previously, to make sure the voice of neurology is heard at the highest levels among decision-makers who control the provision of health care across the world. It is absolutely crucial that neurologists keep politicians and economists fully engaged and aware of the devastating consequences of brain diseases and the impact upon society. The WCN is a major teaching opportunity for many, and the teaching courses are intermingled with scientific presentations to attract the maximum number of attendees. It is always a major task for the organizers to hold themed teaching courses and scientific sessions on the same days to keep the linear structure of a congress. The WCN moves continents for good reasons. The WFN provides education and exposure to neurologists from all over the world, and hence the emphasis may be different in different locations. This is encouraged in order to maintain the individuality and different flavor of each congress in order to avoid carbon copy congresses. For several congresses now, the WFN has made a point on inviting a Noble laureate to deliver the keynote presentation. The XXII congress is no exception. Prof. Thomas C. Sudhof, Noble laureate in physiology or medicine 2013, will deliver “Neurexins and Company: Toward a Molecular Logic of Neural Circuits” Nov. 2. There is now huge emphasis on the place of neurology in the fight against non-communicable diseases. The WHO and the United Nations have taken a major step, and all their agencies are working hard to promote this goal. The WFN has a major role to play as an official WHO partner, and the WCN is a prime showcase venue for the activity. The WHO leadership is well represented, and input will help to move brain health ahead. WHO Assistant Director General Oleg Chestnov will deliver a plenary lecture on the current status of non-communicable diseases and the role neurology is expected to play in the process. Every neurologist knows well that our specialty has changed even over the short and medium term. We are now at the coalface with respect to acute care provision with stroke management and work in intensive care units. This is well represented in the congress, and there is so much to learn. Is it correct to say that the days of general neurologists are numbered, and, if so, how are we ready for it? This may be true in the developed parts of the world, where, for instance, a muscle specialist will not be able to confidently run an epilepsy clinic. It is also true that genetics have opened a whole new world in diagnosis and soon treatment. We now live in world where in April 2015, the British public represented by their parliament voted to approve mitochondrial gene donation. And the world is on the cusp of huge gene therapy changes, which will come with the use of clustered regularly interspaced short palindromic repeats, CRISPR-Cas9 technology for short. Perhaps within a generation, neurologists and their patients will be able to see a huge change in practice. The ability to understand and deliver care at a high level is not easy and at times impossible. One of the roles of the congress in to bring all the expertise of the super specialist to generalists so they may interact, and this can only be done in a general multifaceted setting. Moving to the business of international neurology, the WCN is the only venue for all world neurological societies to come together and interact to organize international affairs in various WFN committees. The main purpose of the WFN is to promote quality neurology worldwide, and this can only be achieved with the full cooperation of all neurological societies and their regional organizations. The highest authority of the federation is the council of delegates (COD). Each member society is represented, and on Nov. 1 the council will meet to go through WFN affairs. The elected trustees and committee chairs will present last year’s activities and the status of finances. There will be elections for a newly created post of WFN treasurer. The last COD following recommendations of the trustees voted to split the post of secretary-treasurer general into two; hence this post was created. There also will be an election for one trustee post, which was vacated when the current secretary-treasurer general assumed his role at the beginning of 2015. 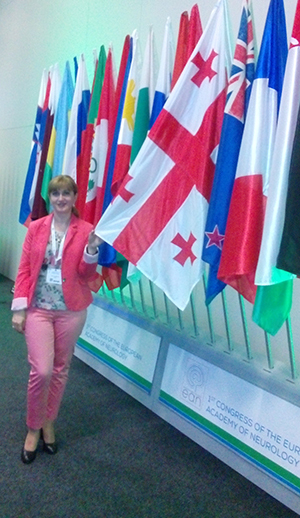 The WFN follows a rotation system in holding its world congresses. This system has worked so far to move the congress to four regions. Europe, Asia-Oceania, Pan-Arab/Africa and the Americas. Following Kyoto in 2017, the turn is on the combined Africa/Pan-Arab regions. Two candidate cities — Cape Town and Dubai — were visited and inspected by the WFN Congress Committee. The delegates will have a chance to hear and see presentations and reports, and then have a vote to choose the venue for 2019. On behalf of the WFN, the trustees welcome you to Santiago to enjoy a most spectacular venue in a most exciting and beautiful country. Our Chilean colleagues with the WFN Scientific Program Committee have laid out a phenomenal program, and I have to add that visiting Chile and it diverse north and south is a pleasure not to be missed. For many, it’s a chance of a lifetime. The exploration of neuromuscular training, especially through the use of electromyography (EMG) in confirming a diagnosis and in classifying neuropathies, is essential to the neurological training course. Thus, the World Federation of Neurology (WFN) took the initiative to open a training center in EMG at the Hospital of Specialties, Rabat, Morocco, to educate young neurologists training in Africa. This initiative has been widely appreciated by neurologists in sub-Saharan Africa. I had the privilege of being the first African neurologist to benefit from this training. In this report, I will share my experiences as an intern, including the different activities I led. The first part of my internship was devoted to EMG and the examination of patients with neuromuscular diseases. The second part focused on EEG, video-EEG and the examination of patients with epilepsy. A teacher supervised all of these activities. During my stay in the EMG unit, I attended all of the EMG activities, examined patients admitted for EMG and those requiring EMG based on diagnosis guidelines, and proposed EMG protocols, which were validated by the teacher in charge of the EMG session. The last two months of my internship were spent in the EEG and video-EEG unit, where I learned different editing techniques, interpretation of EEG during wakefulness and sleep tracings in adults and children. I also attended multidisciplinary medical consultations of patients with myopathies, led by Prof. Nezha Birouk, which allowed me to explain diagnositic approaches, treatment and prevention of myopathies. Through my participation in various multidisciplinary staff meetings, I participated in regular Thursday afternoon staff meetings, which gave instructors from all of the neurophysiology departments the opportunity to share interesting cases from the previous week. I made presentations about clinical cases and discussed the contribution of the wave F in EMG during these meetings. Each Friday morning, one of the neurological teams hosted a conference, and I gave a presentation about a case of drug-resistant epilepsy in adult during one of these. I as well presented a clinical case and had an interactive discussion with staff from the Moroccan Foundation Against Neurological Diseases. Maghrebian Neurological Congress, Agadir, Morocco. During the conference, I had the opportunity to meet Prof. Wolfgang Grisold. The training was a good opportunity to publish articles, while guiding me toward scientific research. My first article, “Frontal Cerebral Cavernoma,” about a case of drug-resistant partial epilepsy was accepted as a poster in the JNLF Congress. The abstract was published in Revue Neurologique 171, Suppl 1 (April 2015): A 97-98. My second scientific work during this internship was a retrospective study of the epidemiological, clinical, paraclinical, therapeutic and evolutionary roles in 40 cases of hemiconvulsion-hemiplegia epilepsy syndrome occurring in the department of neurophysiology at the Hospital of Specialties from 2005 to 2015. The study is being written for possible publication. My neurophysiology training gave me a great opportunity to fill my shortcomings in this discipline. I am pleased with how Prof. El Alaoui and Prof. Ouazzani were so transparent and available to me. Ensure the continuity of this initiative. Provide EMG continuing education support to allow us to consolidate our gains. I want to thank everyone who contributed to the success of my internship in Rabat. I particularly would like to express my sincere thanks to Prof. El Alaoui Faris for his advice and encouraging the success of my training. I sincerely thank WFN for giving me this continuing education opportunity. I thank Prof. Ouazzani for his teaching during my time in service. My thanks also goes to Prof. Birouk for her willingness to initiate us into the best practices of EMG. I cannot forget to warmly thank warmly Professors H. Belaïdi, B. Kably, F. Lahjouji and L. Errguig for their availability and their teachings. Finally, I deeply thank my family in Mali, who supported me in my studies long ago. I owe them what I am today. The neurologic community should congratulate itself for achieving public recognition for our field by organizing public programs. This advocacy method began with the U.S. declaration of the Decade of the Brain in the 1990s. Many other countries followed with their declarations of a year or a decade for the same purpose. In 2013, the World Federation of Neurology designated July 22, the date of its founding in 1957, as World Brain Day. Neurological societies in several countries organized celebrations on that date in 2014, as reported in past issues of World Neurology. The purposes for these celebrations include increasing public awareness of neurological disorders and persuading governments to increase the resources needed to make care available, improve care and carry out essential research. The huge question is how to move from advocacy to improving prevention and effective clinical care in all countries. As I described in the June 2014 issue of World Neurology, the Fogarty International Center at the National Institutes of Health (U.S.) is trying to help with this by developing a program to promote implementation science. This refers to the study of methods to promote the integration of research findings and evidence into health care policy and practice. The ways to achieve progress include calling attention to the impact of existing data (e.g., global burden of disease studies), designing new research studies that will be understandable and appeal to policymakers and exploring how the conversation with a policymaker or funding agency should be framed. The Fogarty Center’s approach to implementation science is to learn what has worked, develop communication among neurologists and neuroscientists wherever there is interest and ultimately, perhaps, offer research funding designated for implementation science. This important initiative, as applied to our field, will be among the topics discussed in “Public Policy and Health Economics” at the 2015 World Congress of Neurology in Santiago, Chile, Oct. 31-Nov. 5. Please use this opportunity to share your thoughts about how to move from information to action. As dementia rises in prevalence, new approaches must be adopted in the treatment of the condition and efforts to prevent it. Dementia means the loss of brain capacity severe enough to result in the loss of self-sufficiency. The incidence of dementia, which is rising globally, is largely driven by the aging population. Although dementia increases with age, it is not inevitable with age. Dementia represents the end stage of several processes, for which some are treatable and preventable. Brain blood vessels (vascular) and Alzheimer’s disease represent the two most common pathologies leading to dementia. The changes of Alzheimer’s disease are characterized by the deposition of amyloid protein plaques and of tau protein aggregation forming tangles in neurons. The changes that lead to Alzheimer’s disease begin about 20 years before any symptoms appear. Many elderly individuals die with plaques and tangles without having had any trouble in life as a result. Similarly, most vascular disease is insidious. For each stroke that affects the body, five affect the mind, usually with the person being unaware of them. While Alzheimer’s and cerebrovascular pathology occur commonly with age, mostly without symptoms, the combination doubles the chances that the dormant pathologies will result in dementia. Although cerebrovascular disease is treatable and preventable, scant attention has been paid to this component, present in 80 percent of Alzheimer’s patients. Instead, the declared intention is to find a cure or disease-modifying drug by 2025. The idea of giving one drug to an amalgam of pathologies broadly defined as Alzheimer’s disease may prove as disappointing as the litany of failed trials that took place in the late 1990s and early 2000s aimed at stopping the damage that follows a stroke with a single drug. Since dementia has multiple causes, one must try multiple therapies, including addressing the one component that can be treated and prevented: the vascular one. Dementia is not a threshold but a continuum. The process begins decades before any symptoms appear, a phase termed the “brain-at-risk stage.” The earlier the risk factors are recognized and treated, the better the chance of success. Knowledge accrues in pieces, but is understood in patterns. Specialization fosters fragmentation and fiefdoms. It turns out that all major brain diseases result from different combinations of half a dozen mechanisms. By integrating this knowledge, researchers may discover that drugs developed for one purpose in one field may have application in another. If we only knew what we already know. The diagnosis of Alzheimer’s disease is notoriously imprecise, mainly because most patients harbor multiple pathologies. Even if a drug were 100 percent effective in blocking amyloid deposition, its effect might be obscured or overwhelmed by concomitant pathologies, for example brain vascular disease and its interactions, such as inflammation, if not treated at the same time. This calls for multiple therapies and new methodologies, such as platform trials to evaluate multiple therapies simultaneously. The lack of precision in diagnostic categories can be overcome by identifying specific contributing mechanisms leading to dementia and treating them. It is now possible to image vascular disease, amyloid and tau protein deposition and inflammation in the brain. Each of these mechanisms can be treated individually or in combination. The evaluation of drugs can be accelerated by developing protocols in close reciprocal interactions with experimental work in a few advanced centers. These would continue with extensive protocols and thorough evaluation of patients. Once experience has been gained, a protocol could be simplified so that large numbers of patients could be enrolled. At predetermined intervals, statistically valid samples of patients following the simplified protocol would be studied by those following the extensive study protocol to make sure that they were similar. In the era of big data and electronic records, it may be possible to do more sophisticated post-marketing surveillance and gain real-world knowledge of the effectiveness of different treatments. Good information is essential, but by itself is no more effective than New Year’s resolutions. Motivation matters but is seldom addressed. Healthy lifestyles require a healthy environment, and policymakers have a particular role in creating it. They also have a leadership role in introducing legislation to curb tobacco and alcohol use and limit the consumption of unhealthy foods. They also have a major role in ensuring that our air is breathable. Air pollution can harm the lungs, damage the heart and afflict the brain. What happens in Beijing matters at Schloss Elmau: We share the same biosphere. Policymakers can follow the lead of Finland in considering health in all policies. Public health could be enhanced considerably through the leadership of non-governmental organizations. Additionally, policymakers can get help from international brain organizations, which can provide expertise and patient support groups, and can help to mobilize the public toward healthier lifestyles and risk-factor control, which may prevent or postpone major chronic diseases, including dementia. Dementia results most often from a combination of Alzheimer’s and cerebrovascular pathologies and their interaction. Cerebrovascular disease is both treatable and preventable. The diagnosis of dementia is imprecise, but it is now possible to identify and target the different mechanisms leading to brain deterioration. This will require multiple interventions and new clinical trial methodologies. Dealing with the challenges of dementia will require not only new resources, but new thinking and different approaches as well. Vladimir Hachinski, MD, is the Distinguished University Professor at Canada’s University of Western Ontario. 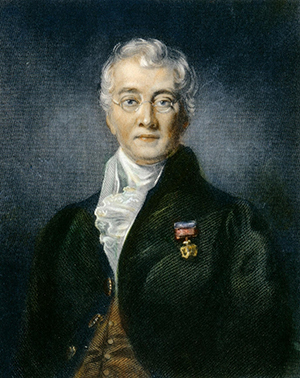 With John W. Norris, he founded the world’s first successful acute stroke unit. With David Cechetto, he discovered the role of the brain’s insula in sudden death, and, joined by Shawn Whitehead, they established a treatable link between Alzheimer’s disease and stroke. He has authored, co-authored or co-edited 17 books and more than 600 widely cited publications. He was president of the World Federation of Neurology from 2010 to 2013 and the founding and past chair of the World Brain Alliance. Article originally published in G7 Germany: The Schloss Elmau Summit. www.g7g20.com.